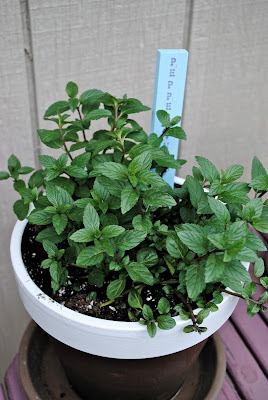 I then planted each of the pots with a variety of herbs. Why, herbs and not flowers you may ask. I don't know. I just think I like herbs better and thought Mikey might might prefer it. (Who the heck am I kidding, he won't even notice). I promise to share some photos of the finished tables when they are done. Hopefully, they will have tablecloths on them. I ordered some last week and haven't heard a thing since. Friday could mean a panic run to Bed, Bath and Beyonce for 90" round tablecloths. Keep your fingers cross that the white ones arrive on time. UPDATE: THE TABLECLOTHS JUST CAME THIS AFTERNOON. YEAH!! Lindalou, I love your project of painted pots and herbs... delightful and would make a great gift for anyone! The sticks are adorable! You could package and sell them...mmmm another business idea!! Love them!! They look great. I can't wait to see the final product! Love the new blog look, love the pots and the painted labels, cute! Love it!! What a great idea!! Hope all goes well! I love these herb sticks. Makes me want to go out and dig in the dirt and eat herbs! (you have a lot of wonderful projects here on your blog!) Congrats on Stinky's graduation!! What a big big time of life. Good luck to him! And thanks for all your visits and comments. What a fun little herb garden. I love the colors you painted the markers - very cute! O my goodness, how cute is this?! Love those little signs!! Super cute idea! I love the colors you chose.